I enjoyed reading this article from a Chicago newspaper which talks about foreign objects in the nose. 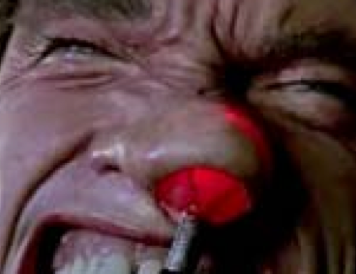 I was in high school when I watched Total Recall with Arnold Schwarzenegger for the first time. While I wasn’t yet ready to be an ENT, I was quite astonished by the scene where he uses some crazy grasper to pull a ridiculous sized probe out of his noggin through his nose. While I haven’t seen this size of an object in the nose before, I was quite disturbed pulling out a live tadpole once. Poor young man was swimming in a pond and felt something go up his nose. He thought it was seaweed and tried to blow it out, but the little guy decided he wanted to stay in there. He had to come to my office for removal. It was still wiggling. Most of the time, foreign objects are a nuisance, not a danger, but there are some objects that do constitute medical emergencies. Disc batteries, like those found in a watch are potentially quite dangers–they can cause septal perforations to develop as well as causing potentially serious harm if swallowed. Other more obvious causes of concern are sharp objects and poisons. The typical age child that tends to put things in their nose is 2-3yo. I’m not sure why that is. I’m not sure they know either, but some are serial offenders. Usually the offense stops when they cram a particular large object in their that requires removal in a doctor’s office. The most common objects that get placed in the nose are beads, toys, and food like cheerios, peanuts, and popcorn kernals, and beans. However, if it’s small enough to fit in the nostril, I can almost guarantee it’s been on the inside of a toddler’s nose at some point somewhere in the world. You might suspect a foreign body if there is a foul-smelling discharge from the nose, particularly if it’s one-sided and did not resolved with antibiotics given for a suspected sinus infection. Other symptoms are nasal obstruction, bleeding, and irritability. If your child is old enough to blow their nose, it’s entirely reasonable to have them try to blow it out. Using nasal saline irrigation (the squeeze bottle type) squirted up the NON-OBSTRUCTED side is effective many times. I wouldn’t recommend this for organic matter such as a lima bean which may swell with hydration if it doesn’t immediately dislodge. In a pinch, you could always try blowing into the non-obstructed side of your child’s nose in an attempt to force the foreign body out as well, but I’ve hardly ever seen this happen even when parents sheepishly admit they did so. In the ENT office, we have many different ways to visualize the nose and remove objects with minimal trauma. The biggest difficulty is keeping the kids calm enough to try. Fortunately, once we’ve gained their trust by applying topical anesthetics and decongestants as well as showing them our atraumatic instruments, kids generally let us get them out without too much fuss. If your kiddo has a foreign body or you suspect one based on their symptoms, please bring them in. If it’s something like a bead, we’ll be happy to take it out. If it’s more disturbing that a live tadpole, I’ll be sure to get them in to see one of my favorite partners.